Experience Sunsuper Riverfire from the ultimate vantage point, Emporium Hotel South Bank’s brand new rooftop bar, The Terrace, on Saturday 29 September from 5.30pm to 9.30pm. The only rooftop bar in South Bank, The Terrace (opening September 2018) offers unparalleled, panoramic views across the South Bank parklands and Brisbane River to the city skyline and beyond, making it the perfect choice to take in all the action of one of biggest celebrations of the year. Tickets are AUD$200 per person and include a four-hour premium beverage package, a selection of canapes and cocktail food by Executive Chef Josue Lopez, and live DJ entertainment. Numbers are strictly limited so early booking is recommended to avoid disappointment. 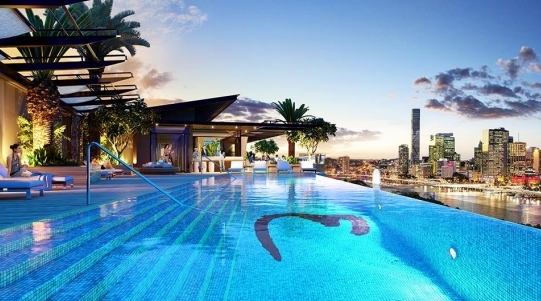 Located on the 21st floor with spectacular, plush finishes, The Terrace sits alongside the Hotel’s remarkable 23m infinity edge pool, with lush landscaping, including mature date palms and Australian natives, giving the unique venue a feeling of subtropical luxe. Developed by the Anthony John Group, Emporium Hotels is Australia’s most awarded boutique luxury hotel brand. The new flagship Emporium Hotel South Bank is located on Grey Street, within the premium AUD$600 million Southpoint precinct. The Hotel has released a limited number of suites in August, with all rooms, food and beverage outlets and facilities scheduled to open through September.